As our season rolls on and the weather starts to improve, I can see good growth in my leeks. But let me remind everyone that size can be detrimental at this time of the year as we are looking for good quality leeks in September, not as big as we can get now to look good in the greenhouse. My JSN leeks are about the size of a pencil. They are in 1 litre pots in a mix of 2/3 professional multi purpose and 1/3 John Innes number 2. The roots are excellent and I may pot a few into 3 litre pots increasing the John Innes to 50% of my mix. I have noticed some of the JSN leeks have started to lift in length and I will nick the buttons to keep them nice and short. My Blanch leeks are in 1 litre pots, ready in a week or two to move into 3 litre pots. They also are as thick as pencils and as I pot on, I will ad the first collars to increase their length. I am just about finished posting leeks now, just a few requests for late Feb delivery. Footnote: Please note I cannot post ANY pot sizes out so please don’t order any pots to be sent via post as they are collection only. Would customers please note that ONLY cells will be delivered by post. No pots at all can be posted and they are all COLLECTION ONLY as stated under each product. I have had a lot of orders that I have been unable to fulfil due to the above so this is really important to make sure your plants are of good quality. It is New Years Day and I hope everyone is clear headed and feeling positive for a fantastic 2018. 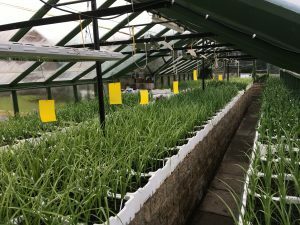 I thought I would do a short blog this morning to let you all know that this coming week I will be posting out leeks and the J.S.N leek is ready for collection too. If you have placed an order online please specify going forward whether you prefer post or collection, unless of course I have already specified in the product page. Please also be patient as I have quite a lot to get through. 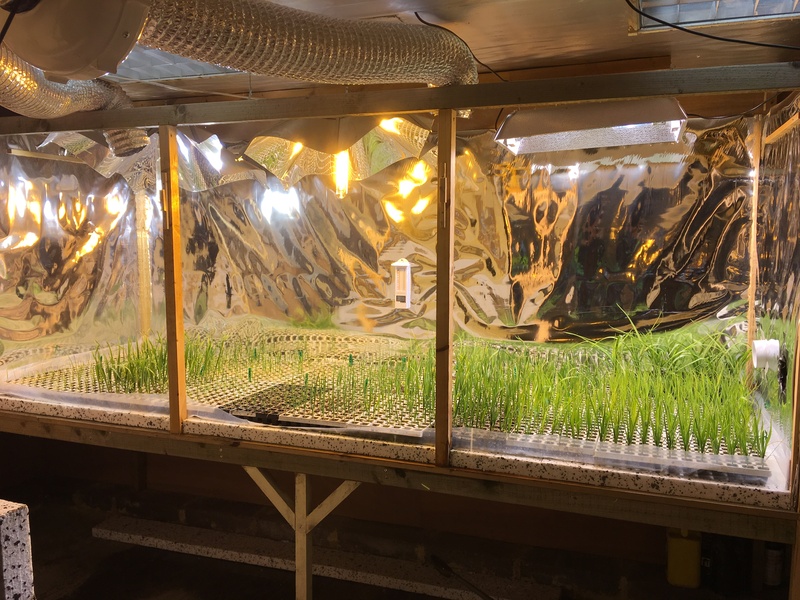 My growth cabinet is in full use at the moment but no plants receive more than 7 days of 24 hours per day light. I will be posting some growing tips each month for you all to look forward to, amongst other things where time will allow. Please use a good quality compost – you only get what you pay for. 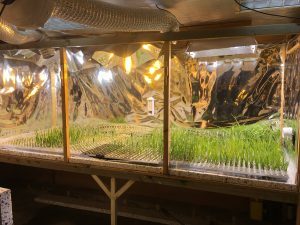 Greenhouse temperatures of 50 degrees are adequate, do not overheat. Wishing a Merry Christmas to all and a very happy and healthy New Year! There is not long to go until xmas now and i am almost sold out of my xmas trees. I can now start to think about my leeks, with lots of potting to do and then posting leeks out in January. I have just taken delivery of my clover compost. As most of you know, i use clover professional compost and also add exemptor insecticide and multicoat 3-4 month slow release fertiliser. This is done in the factory to make sure dosage levels are correct. By adding this to my compost i do not have to worry about spraying or feeding the young plants as the compost additives will look after this for me. I will be potting on at about 6 week intervals, hence adding a fresh batch of feed and insecticide at each potting. This should keep plants growing well and free from pest damage. 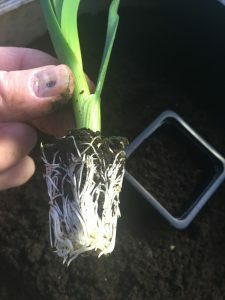 This year I am pleased to be offering my new pot leek the J.S.N leek which i released to a small amount of growers for the 2017 season and Scott Hall went on to win the National Pot Leek Society Championship show. Well done to Scott! For the 2018 season, i ask anyone who would like this leek, to collect in January from my greenhouse in Kibblesworth. I think everyone would agree it is about time we had something new to grow. On the subject of something new, i am pleased to tell you about another release which will be for 2019. Peter Kerry bred a new hybrid pot leek of immense size and superb quality and a new hybrid intermediate leek which is also a very good size and quality. These will both be available from my greenhouse in a years time. Thats all for now, please keep checking the site for new posts to follow in the new year! Sitting here on a freezing cold December morning updating my website for you all to enjoy. I wanted to keep you updated as I am currently extremely busy with Xmas tree sales and will not be able to post any leeks until January. Once I am up and running with the leeks I will be sharing regular blogs and updates for you to help you grow to the best standard possible. I also will share some good news on the leek front. Another customer waiting… see you soon!